In the end, the bombshell was a dud. Bob Carmack summoned the news media to his Michigan Avenue bump shop with teases of hot stuff. He didn’t offer details, but dropped heavy hints that it would be worth everybody’s while to see what else he’d found out in his surveillance of Mayor Mike Duggan last summer, and his assorted disputes with the city, in and out of court. And the media turned out, sitting in the chilly garage area of the closed collision shop. All the TV stations, both newspapers, Crain’s, radio, others. Photographers set up cameras, laptops opened to live-tweet the titillation. There was food. There was candy. Carmack himself was dressed in a sober business suit, his hair freshly cut. A giant banner was set up, with photos of four city players and Duggan, over one ominous acronym: RICO. And then things got going. After some opening remarks by Carmack and his lawyer, Steve Haney, the video started rolling. Video of . . . a city council meeting. 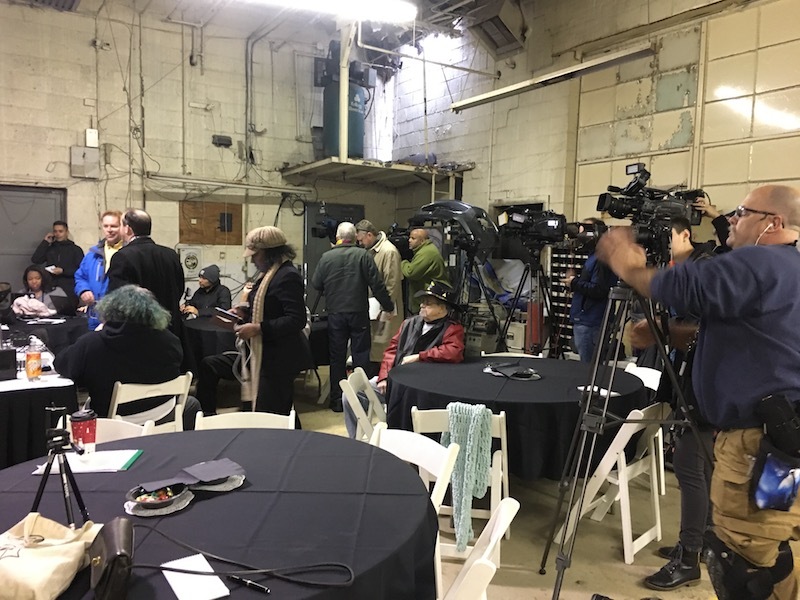 For most of the next hour, a perplexed, then bored, then restless, then peevish bunch of reporters watched snippets of the Detroit City Council and one of its committees, talking about property Carmack coveted, a waterfront parcel and Superfund site in the Delray neighborhood, which he hoped to transform into a luxurious marina/residential complex. It’s this land, he said, that is the source of his beef with the mayor. After he lost his bid to buy the Delray parcel, an effort into which he’d already sunk, he says, $250,000, someone in the city sent him a deed to another piece of property, nearby on Melville Street. He thought it was his consolation prize for what he’d spent on the riverfront piece. And that’s where his feud with the city was born. Carmack ended up selling the parcel for $1 million. The city — under Duggan’s leadership — responded by suing him, claiming he had no right to it at all. The disagreement exploded into public view last month, when Carmack rented two trucks, parked them outside city hall and showed an edited montage of surveillance video he’d commissioned. The video showed the mayor driving freeways, mostly, but also appearing to enter a condo in Wixom, where an attractive woman was also photographed retrieving trash cans from the curb. A few days after that, he filed a lawsuit claiming Duggan doesn’t even live in the Manoogian Mansion, the official mayoral residence. The implication was obvious: The mayor has a side piece. He may even live with her. In Wixom. And Monday, Duggan fired back, calling a press conference where he dropped a legit bombshell: He’d asked the Michigan State Police to open an investigation into so-called “threats” Carmack made against him. Duggan also gave the city’s version of the Melville dispute: The offer was for Carmack to buy the parcel for $250,000, not that he be given it outright. Hence the lawsuit. On Wednesday, however, with the ball back in Carmack’s court, there was no more video of Duggan, or the mystery woman. Rather, after Haney’s passionate opening statement, defending his client and condemning Duggan for using the power of law enforcement to stifle an outspoken citizen, the rest was pretty anticlimactic. Although Carmack has retained communications professionals, there was no attempt to explain what the assembled crowd was watching, and with the video gleaned from public-access records, i.e., stationary cameras and sketchy sound, the wind quickly went out of his sails. There were shots of Carmack asking to develop the riverfront parcel, and the sort of back-and-forth discussion that looks a lot more interesting, and is easier to follow, in the movies. The thread was that Carmack wanted the parcel, and sank considerable money into pre-development hurdles, only to be denied. And when he objected, he said, the city brushed him back, coming after other property he owned, demolishing a car wash across the street from his collision shop, on a weekend he was out of town. And then the room turned on him. “For what you seen. Corruption,” Carmack replied. “This is a city council meeting!” an exasperated Rogulski shot back. Jim Kiertzner of WXYZ-TV was no kinder, pressing Carmack for the “big bombshell announcement” he’d been promised. M.L. Elrick from Fox 2 piled on, asking about the RICO banner; did the people pictured ask for bribes or simply fees for service? Carmack couldn’t say. By then, Deadline Detroit contributor Charlie LeDuff was making jokes. “I’m getting texts from people involved with the mayor and they’re making fun of the coffee and donuts. So you feel like this thing here made you look like a joke today?” he asked. The questioning turned to the state police investigation, and Carmack deflected. He’s also afraid, he said – of the state police and of Duggan. “I have three kids to take care of,” he said “I'm a single father. When someone says they are going to send the state police after me, I'm afraid." Finally, Detroit News reporter Christine Ferretti pushed about what, specifically, Carmack might have on the mayor. He teased yet another revelation.